The scorching sun hardly spares any part of the country for more than four months! Finally, the relentless summer gives way to monsoon and we breath a sigh of relief with the first sweet drops of rain. However, the rain doesn't seem sweet for long as when it gets heavier and its spells become more and more frequent, it turns out to be a destructive natural phenomenon. We can hardly appreciate its beauty when it leaves behind all signs of damages; especially to two of our most precious possessions, home and car. The mental agitation over the loss of these two prized possessions can quickly transform into a financial setback if we are not armed with adequate car and home insurance policies. In many parts of India, monsoon imposes a threat of flood and both motor vehicles and residences get adversely affected by floods. No wonder, we, the residents and car-owners have to go through the ordeal which intensifies in case of no insurance cover in place. Let's elaborate on the importance of car and house insurance plans in India particularly in monsoon. Why a motor insurance is a must for you this monsoon? Car insurance companies in India don't receive as many claims for the rest of the year as they do in monsoon. Car insurance policyholders make claims for their insured vehicles for a number of reasons. Monsoon mornings are quite misty and foggy roads with poor visibility are more often than not responsible collisions of cars which might result into severe damage or total loss of the vehicle. A comprehensive car insurance in India safeguards car-owners in such situations as it covers the financial loss due to damage to the car. Well, a motor insurance plan saves you a million in case of a collision but what will you do if heavy rains stall your new car in water-logged roads? Even a comprehensive motor insurance plan doesn't cover engine damage and the depreciation of motor parts when repaired and replaced. The one and only way to stay protected from these common car damages during monsoon is to avail car insurance add-on covers. Here is a list of add ons that you should grab this monsoon for the complete safety pf your cherished vehicle. These add-on covers don't cost much especially compared to the enormous cost of replacing engine. Hydrostatic Lock Cover - It specifically covers financial losses for repair or replacement of damaged engine parts due to water ingression and hydrostatic lock. Engine Protector – The Engine Protector cover is comprehensive in nature as it provides coverage for consequential damage to engine due to water ingression or leakage of lubricating oil. This add-on also covers damage to gear box of the car. Depreciation Cover – The depreciation cover looks after the total cost of repair and replacement your vehicle parts so that you don't have to pay the depreciation cost. Roadside Assistance – This add-on cover offers assistance to stranded insured vehicles all over India and multiple benefits in the likes of flat tyre assistance, fuel assistance, lost key assistance, towing facility. This add-on cover can provide you with legal help if the situation demands. All these add-on covers won't set fire to your wallet. The damages these covers protect financially are lot more costlier and surely capable of making a big dent in your savings if you are not armed with these add-on covers. Let's take a look at the price of the essential car insurance add-on covers during monsoon. *The cost of Roadside assistance cover varies from one insurer to another. Apart from the cost mentioned above, some other insurers has two slabs for its price such as Rs. 250 and Rs. 750. ** The cost of all add-on covers are indicative and may differ from one insurer to another. Apart from the vehicles, households are the worst sufferers of heavy and long spells of rain. Home-owners usually make some evasive efforts to minimize the loss by shifting documents and portable assets to safer place. You should also check the water level and ensure electric wires are not in contact with the rising water. However, despite these measures, households are still vulnerable to events like floods that many parts of India experiences during monsoon. In this scenario, a comprehensive house insurance policy can save you from financial losses due to damage of structure and assets of residences. While the practice of availing car insurance and add-on covers is pretty commonplace in India as motor insurance is mandatory, there is hardly any demand for home insurance in India. Many home-owners are not even aware of such a cover and many shy away from it due to many wrong concepts about house insurance policy coverage and premiums. But in reality, house insurance plans are inexpensive and come with comprehensive coverage for a range of household goods such as furniture, clothes, electrical, mechanical and electronic appliances, sanitary fittings and fixtures. The coverage of house insurance plans are wide and include losses due to flood along with other natural perils such as fire, earthquake, cyclone, storm, lightning and the likes. Aside from the natural perils, insurance plans for households also cover losses due to missile testing, damages caused by aircraft, terrorist acts, strike, riot, explosions. Now that you know you can beat the flood by picking a house insurance cover for your residence, you should be wondering how much premium you have to pay for it. How much a comprehensive home insurance plans will cost you? You can choose between insuring your household only and insuring your residence along with valuable assets. The plan that includes contents of the household is called package policy. 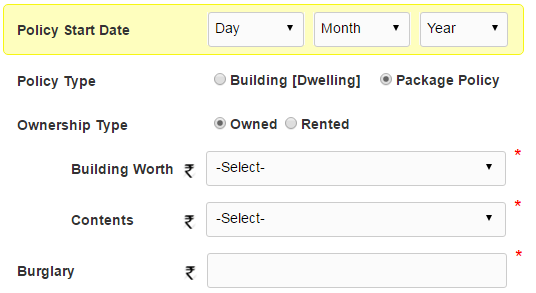 If you want to insure the household only you have to select the building option. You can go for longer tenure to avail discount. If you choose a duration of as many as 15 years, you are eligible for a whopping 50% discount. 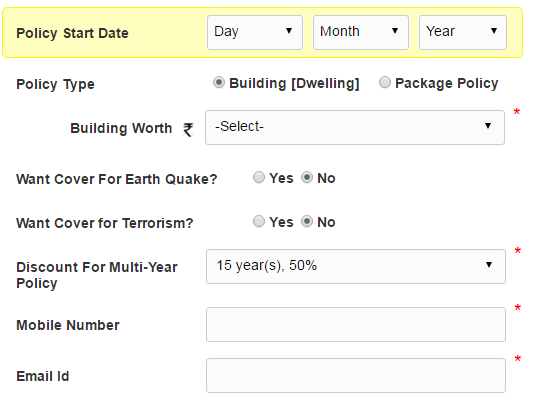 There are also optional covers to cover earthquake and terrorism related risks. If you want to avail this optional cover, the premium will increase accordingly. If you want to cover assets too you have to opt for package policy. If you are the owner of the residence you can cover both the building and the contents. But, if you live in the house on rent you can cover household items only. And the premium will also be calculated accordingly. In your house insurance plan, you can also insure your costly assets specifically. You can opt for separate coverage of particular items. In that case, you have to mention the value of the items you want to cover. 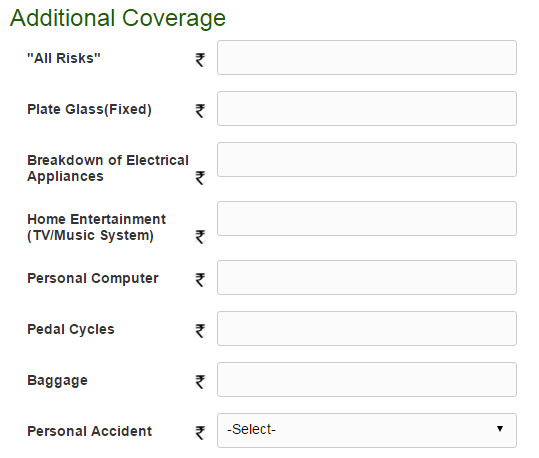 If you select the ‘all risk’ option or you can get coverage of 33.33% of the total content value. By opting for a home insurance package policy you can also cover your third party liabilities. If you or any of your family member or your domestic servant is liable for paying compensation to third parties in the event of accidental death or physical injury to third party and or damage to property of third parties. This coverage is for accidental death, disease or bodily injury to any domestic employee appointed by you or your family. Now you are all set to compare home insurance plans. If you want to insure your house for 50 lakhs and home contents for another 10 lakhs you will get burglary coverage for the same amount of sum insured for home contents. You can further insure your public liability expenses for another Rs. 1 lakh and get a personal accident cover worth Rs. 1Lakh as well. Since your chosen content value is Rs. 10 Lakh you will get a coverage of Rs. 3,33,300 (33.33% of content value) for 'all risks'. After submitting all details you will get multiple home insurance plans in India to choose from. 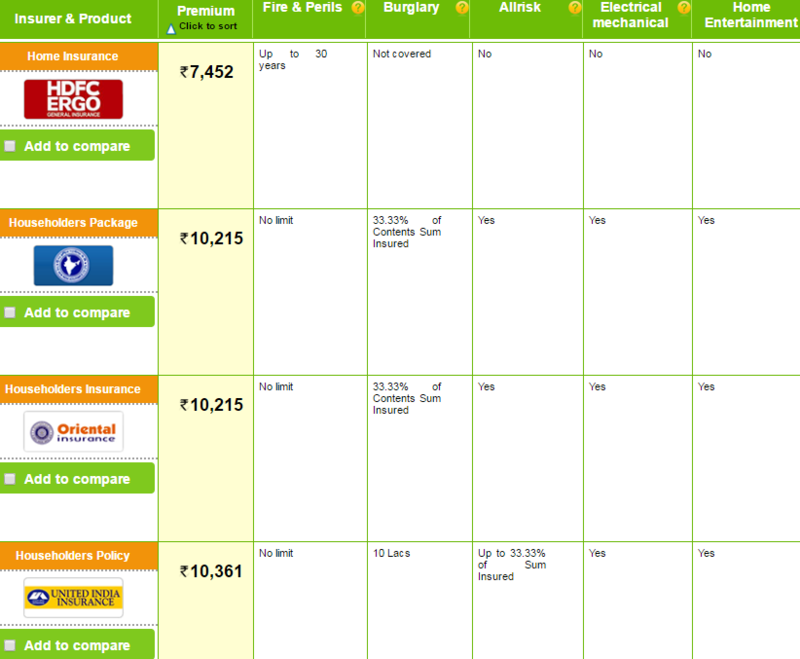 Here are top 4 home insurance plans as per the details submitted. You need to compare home insurance online in terms of premium and different aspects of coverage to pick the best policy out of these 4 plans. Of late, buying home insurance online has become lot easier. To insure contents worth Rs. 5 lakh and above, the online process doesn't require lengthy verification process of documents. The house insurance policy now offers new home contents to replace insured old damaged home contents. This means in case of loss, lost contents are replaced by a new ones of same kind. According to reports, in September 2014, floods caused a staggering 4.4 billion dollar loss in India. So, you should keep two of your most costly possessions protected this monsoon by availing home and car insurance along with add-on cover. Nowadays it takes just 5 minutes to compare and buy home insurance online in India. You can resort to GIBL.IN, the premiere online insurance marketplace in India to grab a house insurance policy online at the lowest price. Delaying decision can cost you dearly, especially now when the monsoon has set in. Get your online home insurance policy today.